Ocean Isle Beach sits just east of Sunset Beach, primarily on the southern side of the intracoastal waterway, however there is a small section around old Georgetown Road to the north that is still part of the city limits. Most people consider everything from Sunset Beach to Holden Beach part of the Ocean Isle Beach area including the Ocean Ridge Plantation, a large golfing community to the north to south of Highway 17. But, when were talking about oceanfront property, the majority of the residential homes are on the south side of the intracoastal waterway with many homes along First Street bordering the Atlantic Ocean. To $950,000 on average. Toward the south end of the community are several condominium and townhome units priced from $200,000-$500,000. At any given time there are roughly 200 properties for sale along this stretch of the East Coast. Some higher in luxury properties can range over $1.5 million, but this is not due necessarily for waterfront property but for the fact it could be a luxury estate, larger lot or lots of amenities such as a dock, boating capabilities, or water for facilities. Lots on the Oceanside are roughly 5000 ft.² to 8000 ft.² and stretch to the ocean. These homes are not in a specific subdivision so most of them do not have any homeowners dues or fees. Between First Street and second Street are many homes priced from $300,000-$600,000 that may or may not have peekaboo views of the Atlantic Ocean depending on the obstruction south of First Street. 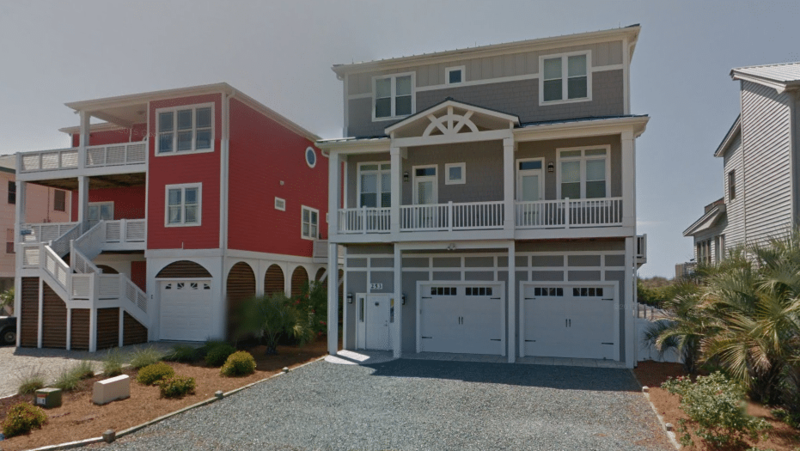 I merrily, these oceanfront homes are set up on stilts with carports or garages on the main level and either two or three levels above that. Up toward E. 3rd St. are several lots available for sale along Chadbourne Street, a cul-de-sac road that goes from the ocean north along Second Street. These lots are between $150,000 and $190,000. The farther one travels up E. 2nd St. the more sparse the properties with typically more land. Residents are likely to see over 10,000 ft.² lots priced from $600,000-$2 million. Currently there is a beautiful nine bedroom home at 410 E. 2nd St. priced at $1.3 million. The farther up one goes the more secluded and private homes become. Because there is no outlet at this end of town as well as limited modern conveniences, these are primarily homeowners that travel up Shallotte Boulevard and Baywatch Drive with homes priced from $120,000 for lots up to $700,000 for three and four bedroom homes around 2000 ft.². Many of these homes feature views of the intracoastal waterway and the Atlantic Ocean depending on where their set. For more information on oceanfront homes and Ocean Isle Beach North Carolina please contact me today. I would be happy to send you a list of properties that meet your search criteria and price throughout Ocean Isle Beach or surrounding communities.